Apple seems to have a location-based tool called Find My Friends in the works for its iOS 4.3 iPhone and iPad update. Although it's not included in the developers beta that was released earlier today, screengrabs from the new Settings app reveal the existence of the Find My Friends feature. The service is likely to be a location-based app à la Google Latitude, allowing you to, er, find your friends wherever they may be. There's a possibility that the Find My Friends app will be part of MobileMe, a premium service that costs an annual fee of £60, but when you can get Google Latitude, Facebook Places, FourSquare and a host of number of other location apps for free, it's not exactly a compelling addition. The location check-in market is becoming well and truly saturated, and no clear leader has established itself yet. 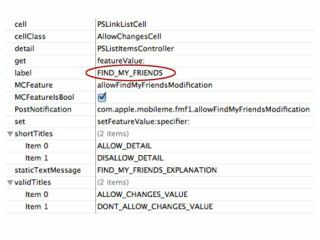 While it's no surprise that Apple wants in on the action, if you don't know many people with iPhones or iPads, you may have to find your friends by using ye olde voice-calling facility to phone them.